Lawsuits Allege 'Grave Harm' To Immigrant Children In Detention Over 10,000 immigrant children are in U.S. custody. In the past year, lawyers say at least 170 willing sponsors were arrested and put in deportation proceedings after coming forward for the child. 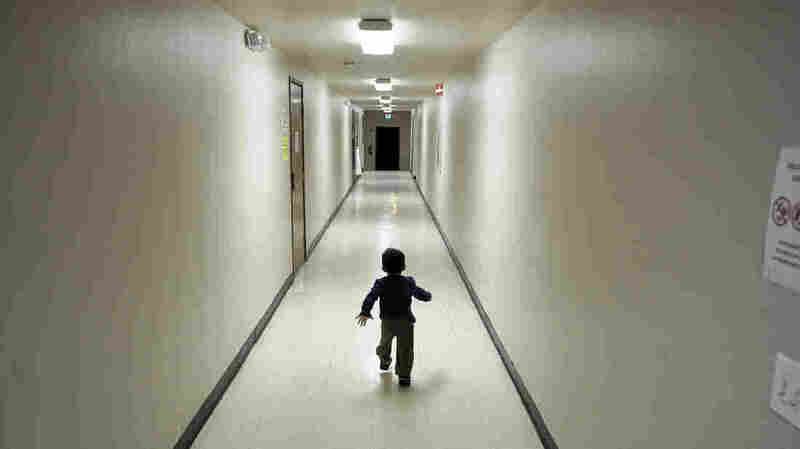 An asylum-seeking boy from Central America runs down a hallway in December after arriving at a shelter in San Diego. Immigrant advocates say they are suing the U.S. government for allegedly detaining immigrant children too long and improperly refusing to release them to relatives. The Trump administration's treatment of more than 10,000 immigrant children held in custody at shelters across the nation is coming under intense scrutiny. Numerous lawsuits claim the government is using the system of child confinement as a way to punish and deport kids and their families. A lawsuit on behalf of migrant children in ORR custody claims the government is violating a federal mandate by prolonging confinement of underage immigrants on the false pretext that adult sponsors are unfit custodians. A class action lawsuit on behalf of migrant children and their potential sponsors challenges "egregious delays" in the release of the youths from ORR custody because of rigorous fingerprint background checks. A class action lawsuit represents migrant teenagers detained by ICE who came to the US when they were 17 years old and arrested when they turned 18; the legal action calls on ICE to follow the federal mandate that immigrant teenagers should be placed in "the least restrictive setting available." A class action lawsuit accuses the Office of Refugee Resettlement of working with ICE to "facilitate civil immigration enforcement against sponsors." At least four federal lawsuits have been filed since March that challenge the way the government cares for child migrants. The legal actions allege that the administration is ignoring a federal mandate to place immigrant children "in the least restrictive setting available." Advocates for the migrant children say they are being locked up for months when there are family members already living in the United States ready to take them into their homes. Most of the underage migrants are teenagers who trek to the U.S. border from Central America alone or without a parent or legal guardian. They say they're fleeing violent street gangs in their home neighborhoods and most of them ask for asylum. They are allowed to live with sponsors while they await their day in immigration court. On Friday, the Southern Poverty Law Center filed a class action lawsuit that accuses the Office of Refugee Resettlement, part of the U.S. Department of Health and Human Services, of working in concert with immigration officers to "facilitate civil immigration enforcement against sponsors." The lawsuit lays out what critics have been saying for months: When family members step forward to take a migrant child into their household, ICE agents will arrest the sponsor if they're in the country unlawfully. According to lawyers, in the past year, 170 willing sponsors have been arrested and put into deportation proceedings. While the enforcement actions satisfy ICE's stated aim to arrest any unauthorized immigrant its agents come across, lawyers say the effect has been to scare potential sponsors from coming forward, which leaves some migrant children languishing in ORR-contracted shelters. Some have been confined since last summer. "However, there would be a short term impact on HHS where sponsors may not take custody of their children in HHS facilities, requiring HHS to keep the UACs [Unaccompanied Alien Children] in custody longer." Mary Bauer, deputy legal director for the Southern Poverty Law Center, said the ORR-ICE arrangement uses "children as bait to catch the sponsors and put them into removal proceedings. We know that because they've put it in writing and said that they're doing it." There is also growing outcry among immigrant advocates over the process by which case workers vet sponsors and discharge children in custody. The SPLC lawsuit calls the process "arbitrary" and "opaque." I feel like they do it to punish the families, which is wrong because the ones that are suffering the most are the children. Kayla Vazquez is a U.S. citizen who is one of 11 adult sponsor plaintiffs. She has been trying to get permission from ORR to sponsor her 17-year-old Honduran cousin, by marriage, who has been held in a shelter since August. In a phone call arranged by SPLC, she told reporters that the caseworker keeps adding more and more requirements for sponsorship. The teenager — who was not named — will turn 18 in May and she's worried the government wants to confine him until they can arrest him on his birthday, and deport him. "I feel like they're playing a game and they're just keeping him there to have the family suffer," Vazquez said. "I feel like they do it to punish the families, which is wrong because the ones that are suffering the most are the children." ORR declined to comment on the recent legal action. "We're currently reviewing the court filing and have no information to add at this time," said spokesperson Lydia Holt in an email. In mid-December, the population of migrant children was approaching 15,000 and ORR was running out of bed space in its network of 130 shelters. When the contractor of the largest shelter, the desert tent camp in Tornillo, Texas, refused to extend his contract, ORR made an abrupt policy change that streamlined how it screens sponsors. "The children should be home with their parents, said Lynn Johnson, the assistant secretary for the Administration of Children and Families at HHS. In an interview with NPR last month, she said, "The government makes lousy parents." Holt said in an email that, as of Jan. 20, the number of children in its care had decreased to 10,700 because of releases to sponsors — down from a peak of 14,600 last month. Immigration lawyers suing ORR say 10,000-plus immigrant children in custody is still too many, and the number should be dropping faster.